I recently discovered the median rent for a one-bedroom apartment in San Francisco, and it blew my mind. Per month. For one bedroom. Is that insane or what? It shouldn’t be all that surprising, given SF is always making the news for rising rents and people living in vans or closets or whatever. But seeing the actual number still astonishes me. And it got me thinking: What could that money get you in other parts of the world — both stateside and abroad? I decided to look at Airbnbs that people are renting, short-term rentals that include furnishing and utilities — meaning they have even more value than a regular apartment. Here are 16 amazing Airbnbs in beautiful places you can rent for the same price (or less!) as a one-bedroom apartment in San Francisco. 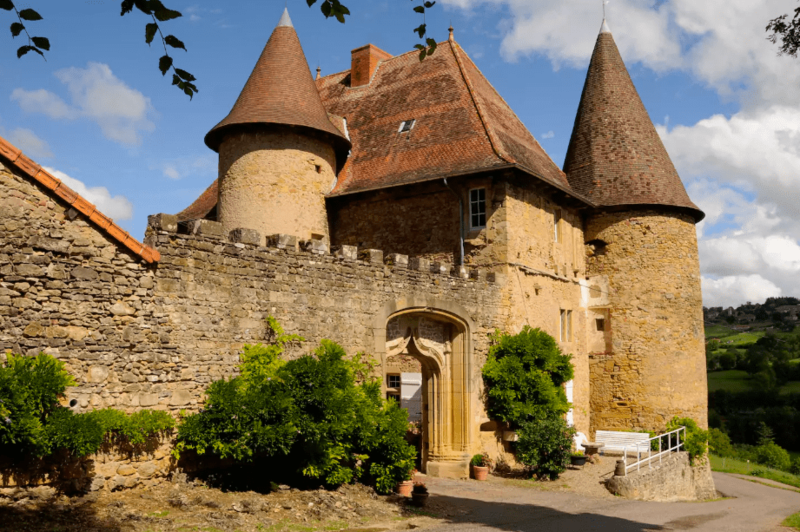 Yup, you can get a castle in France for LESS than what you’d pay for a one-bedroom in SF. It’s accessible via a spiral staircase (swoon) and has a courtyard (of course). Live in an Oakland basement — or live out your princess dreams? I choose the latter. I don’t know what this listing says, but it honestly doesn’t matter. Just look at this little villa perched up high in the Umbria hills. Can’t you imagine sitting by your private pool and sipping sangiovese and eating ALL THE PASTA and never wishing for anything again? City living at its finest. This two-bedroom apartment in downtown Cape Town is ultra clean and airy. Within the building, you can also take advantage of a pool, sauna, gym (which is probs filled with South African hunks) and restaurant. Are you kidding me?! I’m getting on a plane to Bali right now. This Indonesian island is already one of my favorite destinations, and this three-bedroom (with a private pool!) perfectly characterizes the beauty and tranquility you’ll experience there. So this jungle house isn’t that screamin’ of a deal given the Nicaraguan cost of living, but Isla de Ometepe is absolutely magical — and this place is so unique that I couldn’t not include it. I mean, just look at it: It’s entirely solar-powered and hand-built from local bamboo, wood and stone. It’s located on an organic farm and has views of neighboring volcanoes. This three-bedroom apartment is bright and charming — just like the Portuguese city it’s located in. I adore the modern and minimal furnishings, and can totally picture myself relaxing here after a tough day strolling Lisbon’s romantic streets and stuffing myself with pasteis de nata. Oh, and it comes with a juicer because of course it does. Thailand’s one of those countries everybody dreams of escaping to. And this villa is another one of those listings that makes you wonder: Why am I still living in the U.S. again? Private pool, steps from the beach and “spectacular” sunset views? It’s go THAI-me. Omg, I want to wrap myself up in this apartment’s clean and minimalist look; it’s the kind of place I’ll always dream of living in — but never actually will. But we can dream, right? You could get a whole month in this large two-bedroom for the same price as an average SF apartment. Plus, steak and wine and salsa dancing outside your front door! This alpine chalet is nestled in the mountains of Slovenia, and whether you go in winter or summer, it looks positively idyllic. It has a wood stove, two (!!) balconies, breathtaking views and enough room for you and six of your homies. This fabulous flat is located right in the thumping heart of Istanbul. And though it’d be exciting to be so close to all the attractions, it’d be even better to enjoy the city from your massive balcony. Not only are there killer views of the ocean and city, there are multiple BEANBAG CHAIRS from which to enjoy them. All for a grand less than what you’d pay for a mediocre one-bedroom in the Bay. I’d feel like a total celebrity staying at this gorgeous hillside house. On an island. In Greece. Mostly because it has an infinity pool, and I automatically associate infinity pools with the other half. … Maybe it’s time to move to Greece and live like them! Well, you’ll have lots of opportunities to learn Mexican cuisine if you live in this sleek apartment in Mexico City… located in the foodie part of town. And lest you think these wondrous spaces are only available internationally, here are a few options in American tech hubs that might change your mind. TIL what 3/2/2 means: three bedrooms, two baths and a two-car garage. I probably didn’t know that because I’ve never looked at a house that has a garage — let alone one with room for multiple vehicles. This big 3/2/2 clocks in at 1,500 square feet and comes with a fenced backyard, a 3D Bluray player (with glasses) and a modern aesthetic. Don’t forget: This is in the U.S. — for less than the price of a ONE-bedroom in SF. Want to live in the country, while staying close to the tech nexus known as “The Triangle”? Rent this roomy two-bedroom located 15 minutes from downtown Raleigh. The photo above is of the home’s sunroom — because who doesn’t need one of those? Try getting a sun, er, fog room in San Fran at this price! This adorable Seattle home is surrounded by greenery and comes complete with a BBQ, fire pit and patio furniture. And a big bathtub for when you want to come back in and warm up. At less than two grand, it’s practically a bargain when compared with SF apartments — and don’t forget Seattle’s got a lot of tech jobs. Ugh, I’m obsessed with the design of this Colorado bungalow. That kitchen! Those books! That subway tile! Ooh, and a dreamy outdoor fire pit with chairs and a hammock? Pure heaven. Plus, Google’s planning huge expansions of its Boulder campus. So, of course, cheaper than San Francisco ≠ cheap. But even if you’ll never be able to afford living in SF — or any of these gorgeous Airbnbs — it’s worth remembering that a change in location can also mean a big change in lifestyle! Your Turn: Do you live in San Francisco? Think it might be time for a move?